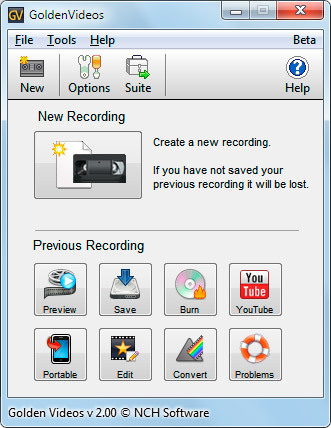 Golden Video Free VHS to DVD Converter helps you to convert your VHS tapes onto DVD or to avi or mpeg files. It is designed specifically with VHS video cassettes in mind and has been developed to make the conversion process as easy and intuitive as possible. Just install the software and follow the step-by-step wizard. This software does more than just create digital video from VHS cassettes. Add effects like sepia, black and white etc. ...... Also included are a number of image restoration tools that can be automatically applied to the video cassette being converted as it is saved to a popular video file format. Once your tracks have been converted you can burn them straight to CD with Golden Videos' own CD Burner, include your favorite moments in a slideshow using PhotoStage Slideshow Creator or convert it to a format suitable for a portable device, like an iPod with with Prism Video Conversion Software. * Converts and digitally restores VHS tapes to DVD, avi or mpeg files. * Simple intuitive wizard takes you step-by-step through the conversion process. * Includes full feature DVD burning software to record DVDs after the VHS to DVD wizard runs. * Automatically detects the end of the video so you don't need to wait and watch. * Add captions to the video if required. * Adjust and correct color. Qweas is providing links to Golden Video Free VHS to DVD Converter 1.20 as a courtesy, and makes no representations regarding Golden Video Free VHS to DVD Converter or any other applications or any information related thereto. Any questions, complaints or claims regarding this application Golden Video Free VHS to DVD Converter 1.20 must be directed to the appropriate software vendor. You may click the publisher link of Golden Video Free VHS to DVD Converter on the top of this page to get more details about the vendor.